Style Notes: T minus three days until the Met Gala. 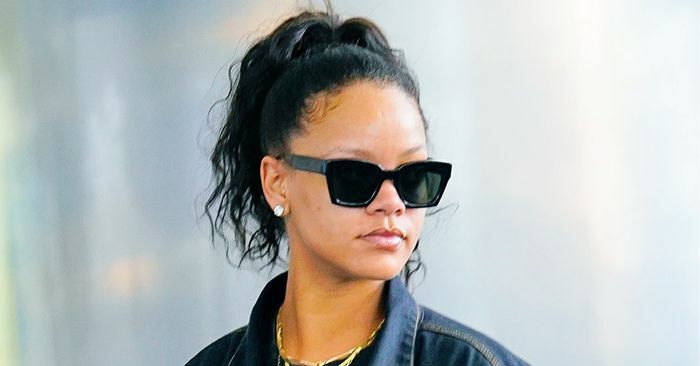 Rihanna just touched down in New York ahead of the event, which she is co-hosting with Amal Clooney and Donatella Versace, wearing a super-casual outfit. Her extra-large denim jacket, slouchy sweatpants, and slippers-and-socks combo make basically the most comfortable airport look we’ve seen in a while. Now, we’ll be waiting with bated breath to see what she has up her sleeve for the red carpet on Monday. Something tells us it will be a bit more over-the-top than this. Style Notes: While a little black dress can certainly stand alone as a hero piece, adding something extra special—in this case, a statement belt—takes a going-out look to the next level. Style Notes: Choosing a classic, all-black (or at least mostly black) outfit is a shortcut to making any look a little more polished and sophisticated—yes, even sweats. Style Notes: As Rihanna just showed us at JFK airport, if you’re going to wear Uggs, you might as well make it fashion and pair them with forward yet comfortable pieces. Style Notes: The songstress and style icon really went 100% into metallics with a look that featured a reflective sheen from head (or earrings) to toe. Style Notes: Leather on leather doesn’t have to look like it’s straight out of The Matrix. A minidress with a bustier-style top and a draped trench looks ultra cool with strappy sandals, a slicked-back ponytail, and a red lip. Style Notes: A general rule of thumb is choosing one voluminous piece to be the hero of your look. Here, Rihanna casts aside the rules in favor of two billowy pieces—and it totally worked, thanks to a figure-hugging, corset-like detail at the waist that grounds the look. Style Notes: Coordinate your lip color to your shirt? Why not? Here, Rihanna demonstrates her version of matchy-matchy—which is very subtle and totally cool. Style Notes: Denim is an obvious choice for pants and jackets—but what about boots? Rihanna puts her own spin on the jean-queen look, opting for knee-high, slouchy stiletto boots that totally make the outfit. Style Notes: Rihanna is the master of working a monochrome ensemble—even in daring bright white. Elevate your airport look like the style star by finishing off laid-back pieces with a leather shoe and statement sunglasses. Style Notes: The style star is known for playing with proportions—and that means sometimes the top half is enough to carry the whole look. Here, her oversize blazer works as a minidress of sorts, accessorized with razor-sharp mules, a gilded bag, and of-the-moment oval sunnies. Style Notes: To avoid a rolled-out-of-bed look that’s too literal, style with a silky overcoat and tonal heels—and make sure your glam is on point. Style Notes: Shimmy down the shoulders of your button-down shirt (or dress) to instantly fake a V-neck shape. Style Notes: Don’t stick to traditional body shapes (like an hourglass)—use exaggerated proportions to dictate your own silhouette. Style Notes: Before you leave the house, throw on one more statement piece… instead of the old Coco Chanel advice. Style Notes: Even a casual look can benefit from a bit of footwear bling. Style Notes: Rihanna’s lace-up boot leggings take center stage against a classic trench coat. Style Notes: Don’t shy away from oversize denim pieces. Pair them with more slim-fit basics or a cropped top to balance the proportions of the bold look. Style Notes: Who’s to say green doesn’t pair well with pink (or orange or red, for that matter)? Style two contrasting colors, and you might be pleasantly surprised by the result. Next up: Take a look at the Gigi Hadid outfits we all want to copy. November 9, 2018 Comments Off on Would you ask your colleagues what they earn?